I am reaching out to you to tell you about We Dine Together, an exciting event happening right here in the San Francisco Bay Area on November 3, 2016. All over the San Francisco Bay Area on the same night, a group of popular, high-end and elegant restaurants will donate a table for 6 to Beyond Differences. The top-tier chefs are creating an amazing dinner experience, including wine. 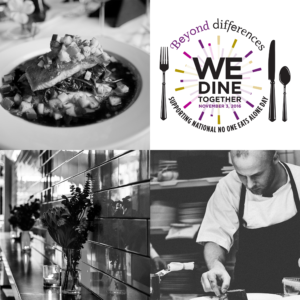 This We Dine Together elegant and fun event will benefit the national No One Eats Alone program put on each year by Beyond Differences to help end social isolation among middle school aged children. No One Eats Alone™ teaches everyone how to make friends at lunch, often the most difficult part of the school day. Created and organized by students, this is Beyond Differences most popular program where schools in all 50 United States participates! National No One Eats Alone Day is Friday, February 10, 2017. Sign up here for more information.